Simple and easy recipe for Burger Patties. Made with minced meat, onion, garlic, pepper, salt, soya sauce, cornflour and butter. Chop finely onion and garlic. Mix all the ingredients together evenly to get a firm mixture. Divide mixture into 4-6 portions. Shape each portion into flat rounds of about 1 1/2cm / 1/2" thick. 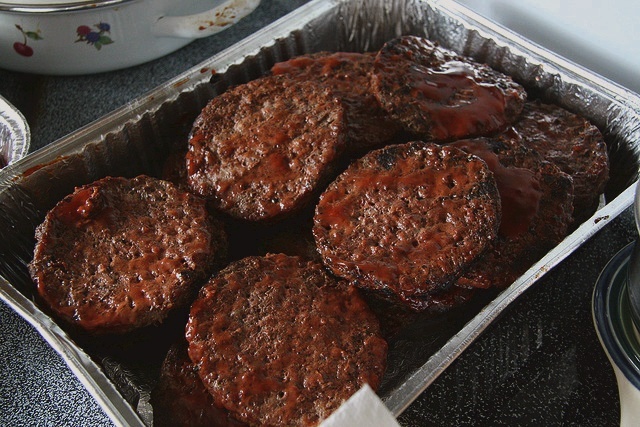 Fry or grill burger on both sides till golden brown. Sandwich burger in between buns or toasted bread. Serve with sauce of choice, salad and pickles. I am definitely cooking these on the grill! Can’t wait to try these! i would rather but these patties. these recipe looks too simple.